These blogs, websites, articles, and books all changed my life for the better. The key to (almost) all happiness is financial well-being. A big pile of money lets you quit a job you hate, cover emergencies, and sleep soundly at night. You might even get to retire decades before other people do. Interested? Get Rich Slowly – Years of common-sense financial advice from every angle imaginable, including reader success stories. I’ve read GRS for 7+ years and credit my financial well-being to this site. Mr. Money Mustache – Straightforward financial advice from a smart guy who rejected consumerism to live on his own terms. 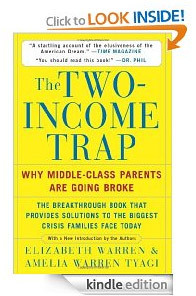 The Two Income Trap – Best financial book I’ve ever read. Shows how families become over-leveraged and why spending both incomes is so destructive. Super-Charge Your Income – Frugality only goes so far. Get Rich Slowly’s massive guide to earning more never fails to inspire me. Vanguard – Don’t let your money fester in a checking account earning zero interest! Two steps: 1) Open account. 2) Insert $1000 into the VFSAX fund. Boom – you’re an investor! Now your money’s working for you. Capital One 360 – Formerly ING Direct. No fees, no minimums, just a good place to stash your emergency fund. 0.75% interest isn’t great, but it’s better than the 0% you get leaving your money in checking. Ask a Manager – Alison’s advice has me negotiate better starting salaries and navigate office politics. If you work for anyone, you should read this blog. Young House Love – Young 30s couple renovates their home(s) to spectacular results! Plenty of step-by-step “this is exactly how you do this awesome thing” guides for the rest of us. Un-f$%# Your Habitat – Daily/weekly challenges to whip your home into shape. 100% unadultered cleanspiration. Terrible Minds – Good writing advice. Mary Sue Litmus Test – Exactly what it says on the tin, plus loads more good writing advice throughout the site. Ask Metafilter – Questions about, well, everything with well-thought out answers from a diverse community. Careful: Ask Metafilter can be addictive. The ‘Busy’ Trap – This succinct NY Times opinion piece explores the over-scheduled hell a lot of people feel obligated to live in.